As the high performance rifle market continues to push the boundaries of conventional engineering, few manufacturers have been able to establish their dominance within the crowded field of evolving bullet technologies. The Winchester 55 grain .223 Polymer Tipped Ballistic Silvertip however has remained a staple for hunters across the country, and delivers a level of performance that only WInchester could only ever deliver. Winchester Silvertip ammunition utilizes Winchester’s patented Silvertip polymer nose cone technology to enhance the inherent stability and velocity of the round during all phases of flight. Upon impact and formation of the terminal cavity, the polymer nose cone is plunged back into the hollow point cavity, and violently expands the copper jacketed boat tail hollow point round from the inside out. This creates a truly devastating wound channel that is often larger than the bullets diameter itself. The signature Lubalox black oxide coating forms an inert barrier around each individual brass cartridge, and prevents oxidative forces from corroding the .223 cartridge during extended deployments in the field. 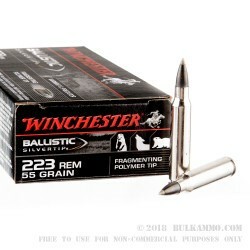 At an average muzzle velocity of 3,249 feet per second, the Winchester 55 gr. 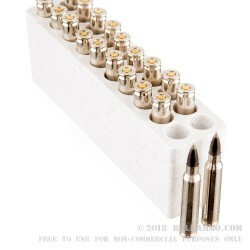 .223 Polymer Tipped Ballistic Silvertip has an inherent velocity over three times the speed of sound, and will take down even the largest of medium sized game with frightening efficiency. 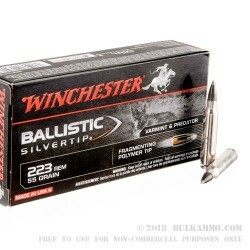 Hunters looking for the ultimate in .223 hunting performance should look no further than the Winchester 55gr .223 Polymer Tipped Ballistic Silvertip. Q: is there a difference between boat tail and non boat tailed .223 rounds? and which one can my Ruger mini 14 ranch use? My Ruger can also handle the 5.56 round as well..
A: The main difference between a boat tailed bullet and a non boat tailed bullet is the inward curve at the base of the bullet, the area that is covered up by the brass. A visual inspection of the rounds themselves will not indicate if there is a boat tail since this cannot be seen. The manufacturer will type this on the box. 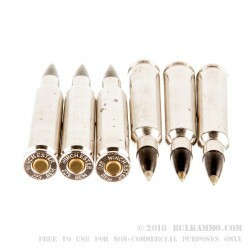 Boat tailed bullets have become a standard with most manufacturers over the years. The use of this feature is to increase accuracy of the bullet at a greater distance. The shooter may not notice any difference at closer ranges and will not function in the firearm any better or worse depending on if the boat tail is present.